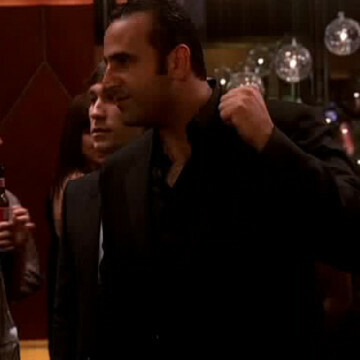 Iranian-American entrepreneur Sam Nazarian offers a short cameo appearance near the two-minute mark of season four’s eleventh episode, No Cannes Do. He greets Turtle and the rest of the Vincent Chase posse as they cross paths in one of Nazarian’s Los Angeles nightclubs. He offers the entire group access to his table and congratulates Vince on his acceptance into the Cannes Film Festival. Sam is the founder and CEO of SBE Entertainment Group, a privately-owned real estate company that owns and manages hotels, clubs, and restaurants in all corners of the US.